Website announcements, news, questions, feedback, or change requests. Topics of troubleshooting or complaints regarding the TVF site or staff. Get help with all aspects of the site or offer suggestions and constructive criticism. No, It's not spelled wrong. This forum is for off-topic discussions. Anything goes so if it doesn't fit somewhere else, throw it in the "hole"! Bulk candy, gum, novelties or flat. Discussions of all bulk vending related topics. Forum for all beverage and food vending discussions. If you can eat it or drink it, discuss it here. Forum for discussion of coin operated skill cranes, video games, pool tables, touchsreens, jukeboxes, sport games, kiddie rides and others. Discussions about "On Your Honor" snack box vending. Vending coffee? From machines to supplies to client retention, this is the spot to discuss all things java. Learn more about "vending cash" here in the Automated Teller Machine topics. All other types of vending businesses can be discussed here. 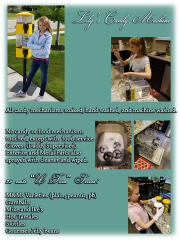 This includes personal product vending, laundromat vending, etc. Self locating tips and discussions. Also customer reviews, questions for, or discussions about, professional locating companies. Maintaining a legal vending business depends on proper business structure, licensing, tax accountability and insurance. Discuss these items here. Information is not guaranteed, and the opinions of the posting member. Remember to seek the advice of a legal Professional. 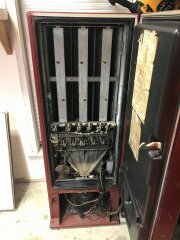 Like vintage automobiles, vending machines can make great restoration projects. Use this forum to show off your best machine refurb projects. Back from the ashes is the Revenue Reports section. Bulk vending news feed from The Vending Times. 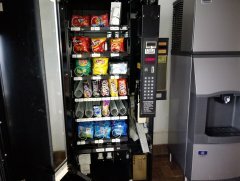 Full line vending news feed from The Vending Times. Editorial articles from The Vending Times. Copyright 2007-2018, The VENDiscuss Forum. All content, information, and opinions (collectively, the "material") presented on The VENDiscuss Forum at VENDiscuss.com (the "discussion board") are those of the authors of the posts and messages (collectively, the "participants") and not VENDiscuss. VENDiscuss does not guarantee the reliability, completeness, accuracy, timeliness, or up-to-date-ness of the material presented on the discussion board. The material is published "as is" and does not represent the official views and opinions of VENDiscuss, its administrative staff, or any company. Any reliance upon the material presented on these forums shall be at users own risk. VENDiscuss does not review the substance of the content posted by its users and is therefore not responsible for any of such content. VENDiscuss merely provides a space for its users to express and exchange their own opinions. This website is made possible by the generous donations made by our supporters. Your donations allow us to continue to bring you quality vending related content. Please help support the VENDiscuss community by visiting and posting often. Donate to support this VENDiscuss.